The city of Segovia is in the autonomous community of Castilla y León and the station is called Segovia-Guiomar. The station was put into operation in 2007 with the inauguration of the LAV Madrid-Segovia-Valladolid. This line has a great importance in the Spanish railway connections, because thanks to it, it joins Madrid with the northwest of the Iberian peninsula and also with France. The name of the station, Guiomar, was chosen by ADIF. They wanted the name of the station to be connected with the city of Segovia and not to be religious. The name of Guiomar comes from the poetry of Antonio Machado. Guiomar was his Platonic love during his last years, and he met this woman in Segovia. Guiomar was the nickname that Machado gave to Pilar de Valderrama. Machado lived and worked in Segovia between 1919 and 1932, and he often travelled to Madrid by train. The station is located above the tracks and the installation is like a bridge above the tracks. It offers services of Long Distance and High Speed. The station was constructed in this way to take advantage of the topography of the area. The materials that were used for the construction of the finishing touches were aluminium, glass and limestone. In the lobby you can find all the services you need and the station is completely accessible for people with reduced mobility. The station has 6 standard width tracks and two platforms with its own canopies. For Segovia, the arrival of the Spanish High Speed ? ?was a symbol of growth and recovery, both from the railway as from the economic point of view. In 1993 the conventional line that joined Segovia with Medina del Campo was closed. That meant the loss of the connection with the north and northwest of Spain. This meant that Segovia could be marginalized in order to stop the development of the city. Thanks to various mobilizations by different sectors, in 2007 the LAV Madrid-Segovia-Valladolid line and the Guiomar station were inaugurated. This line and the station are therefore closely related. Segovia is a splendid city where you can visit unique monuments. You can visit the aqueduct, the Jewish quarter and the cathedral. If you are looking for a nice scenery, Segovia will not leave you indifferent. 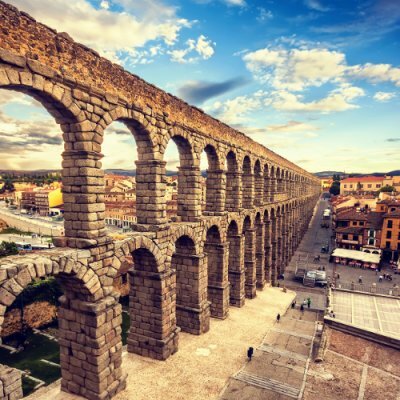 Segovia is a city with a historical heritage bathed in different cultures which is all very well preserved.